Are you expecting to become a new mama or mama again? Maui Beach Yoga is a safe and gentle Yoga experience on the beautiful beaches of Maui. Candy, owner and founder of Maui Beach Yoga, worked for the Maui Childbirth Assoc. 1976 to 1980. She was trained to teach Lamaze birth classes by respected RN’s at Maui Memorial Hospital. She has two sons and three grandchildren. She is a dedicated mother, grandmother and Yoga enthusiast. 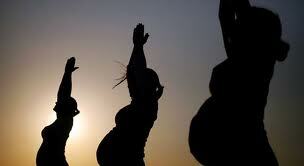 Her extensive trainings in Yoga communities’ world wide are shared with pregnant and new mothers. Come join us and give yourself a calming experience listening to the waves on Maui’s most beautiful shores.